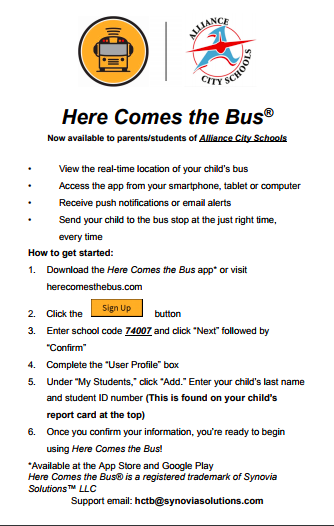 Download the Here Comes The Bus app on your smart phone to learn where your child’s bus is- in real time! Receive push notifications and email alerts and send your child to the bus stop at just the right time every time. Download the app and click the “sign up” button. Enter the school code 74007, and complete your user profile using your child's ID number found on their report card. Get alerts when the bus is near your home or bus stop and when the bus lets your child off. No more waiting out in the cold or rain for the bus and get alerts if your child’s bus is running late at the end of the day.